There is no prettier flowering tree than a dogwood, in my humble opinion. I love the bold white flowers (actually bracts surrounding little yellow flowers) in springtime, the lush green leaves on branches arranged gracefully in horizontal planes in summer, the burgundy fall color and bright red fruit that is favored by birds in autumn. Even its bark is outstanding, textured with small gray to black scaly blocks. In winter, the small chalky-gray flower buds stand out. 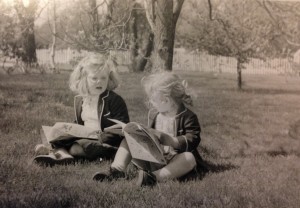 I have a childhood photo of myself and my sister reading books in the grass below “our” dogwood tree. It was a fairly young tree then and there was plenty of sun to grow grass beneath it at our house on Long Island. I remember this dogwood with affection. By the time I was a teenager, its crown was full and the tree cast significant shade. We often took photos of friends and family in front of this graceful tree. Linda and Donna Legare under their dogwood tree in the 1950s. Family photo. Flowering dogwood (Cornus florida) is a small understory tree that grows up to 25 or 35 feet. Its natural range extends from eastern Canada all the way to North Florida. Dogwoods were heavily planted in urban and suburban areas in Tallahassee in the late 1950s through the 70s. Many of these trees have died, due to old age. They are not long lived like live oaks. Unfortunately, people have been having trouble reestablishing dogwoods around Tallahassee. If your soil is just not up to par, you will probably fail with a flowering dogwood tree. Instead try a different species. Other native spring bloomers to consider are red buckeye, fringe tree, Chickasaw plum, redbud, silverbell, parsley hawthorn, and crabapple. But if you’ve got the right soil, I would encourage you to try a dogwood. I plan to plant one this week to replace an old one that has reached the end of its life. I will miss this old tree!